Choi Jae-hyeon , the leader o f Genius, explains how the exhibition was put together. Photo by Park Jae-won. An exhibition visitor feels the Braille explanation inscribed on the displayed photo. Photo by Park Jae-won. of six college students and recent graduates of diverse disciplines, is at the forefront of making cultural opportunities available for the visually impaired. Their recent photography exhibition “Looking through the Heart” is comprised of 15 photography pieces all taken by the visually impaired themselves. 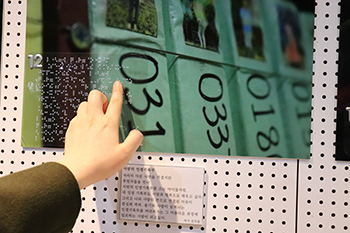 The exhibit which took place from Feb. 21 to 26 at the Chungmu Startup Cube, exemplified a cooperative project between people with disabilities and those without disabilities. The organization first came together in August 2018 as a group of motivated university students who were interested in planning and implementing cultural events, without any specificity for aiding people with disabilities. However, in drafting several ideas for cultural events, they came up with a proposal which would make leisure and cultural opportunities for the visually impaired more accessible. Luckily, this received positive feedback from bigger event coordination groups that could fund their efforts, and subsequently they chose photography as the medium for self-expression. 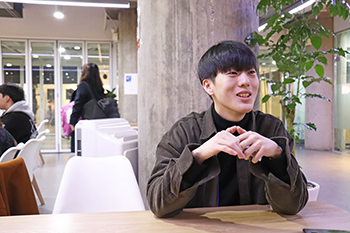 “Even though the visually impaired might not be able to approach photography in the same way as people without visual disabilities, the longing to take pictures and to remember certain events or moments is the same,” explained Choi Jae-hyeon, the head of Genius. Genius’ initial steps in putting together the exhibition started in late 2018 and included contacting several social welfare centers throughout Seoul. This allowed them to get in direct touch with people with visual impairments. By meeting these people and engaging with them through various activities, the exhibition coordinators sought to connect with them on a deeper level. They did not want to simply teach basic photography skills with an auto-focus camera, they wanted more substance and personality in each and every one of their photographs. “We went shopping, wrote bucket lists and thought about numerous activities which would give us a real understanding of what these people enjoyed in life,” Choi said. With these preferences and hobbies in mind, the Genius team came up with a more inclusive way of introducing photographers: replacing a written introduction with a box of objects which represented their hobbies, such as harmonicas, wine glasses and puzzles. In addition to the box of artist-introduction, the exhibition also included other features which considered the particularities of the visually impaired. The Braille explanations of each of the photographer’s emotions and background for selecting the scene, is an important non-visual indicator of why they wanted a picture of that specific situation. Moreover, other members from the community of the visually impaired who have not been involved in the exhibition project could also share the experience. The exhibition brought in devices to facilitate the viewing of the visually impaired. This included a phone application which would read out the written descriptions of photographs and an artificial vision device called MyEye2.0 developed by Orcam. “If you fix the gaze of the MyEye machine on the photograph, which takes the form of glasses with a camera and an audio component, it will read out the description of the photograph to the user,” explained one of the exhibit organizers. Even though Korea is behind certain developed countries in its public awareness on people with handicaps and their inclusivity in society, the speed at which things are changing is remarkable. “Perceptions are changing quickly and opportunities curated for the inclusivity of these people are increasing so much that one day, we can hope for a truly non-discriminatory and harmonious society,” Choi said.